The City Ground was named after Nottingham was granted its City charter in 1897 just prior to Forest moving there in 1898. Ironic really as the ground isn’t actually in the city, being situated on the other side of the Trent in the Bridgford district. One of the original committee men had the foresight of installing one of the first ever football ground drainage systems, a very primitive two foot layer of substrate helping the pitch drain off quickly. This though wasn’t much use in 1947 when a flood left the ground six foot under water and Forest moving in with neighbours County for a while. The picture below was taken, from a 1970's Football Review magazine. "The City Ground has been the home of Nottingham Forest since 1898 and has a capacity of 49,000 with seating for 6,450 spectators. 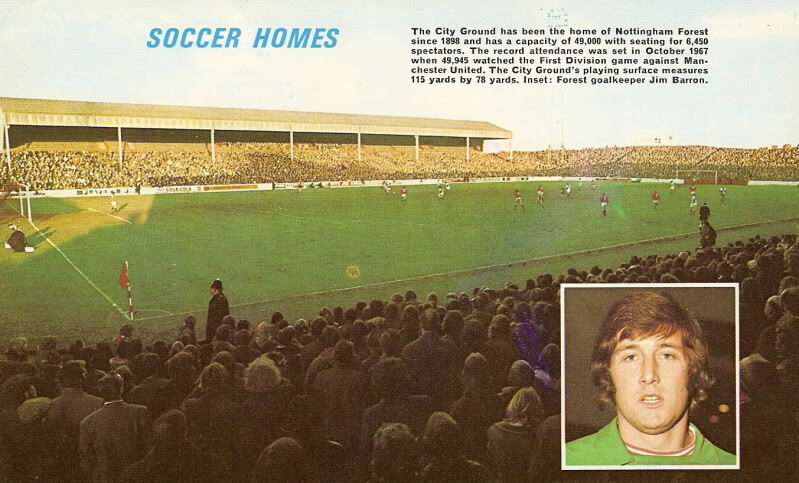 The record attendance was set in October 1967 watched First Division gane against Manchester United. The City Grounds playing surface measures 115 yards by 78 yards. Inset: Forest goalkeeper Jim Barron."